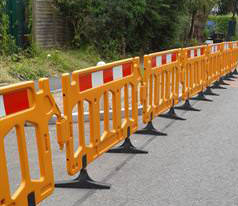 Our high visibility barriers will help direct and protect pedestrians and vehicles. 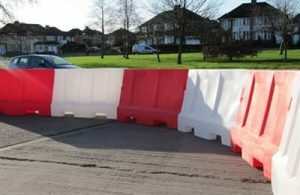 Our range of water-filled barriers has been designed to last for many years. Evo barriers are fully interlockable and provide a solid barrier with no gaps when they’re linked together. They are easy to transport, stack and assemble and can be filled with water or sand for stability. Each barrier is compatible with mini-mesh panels, reflective posts and planks. 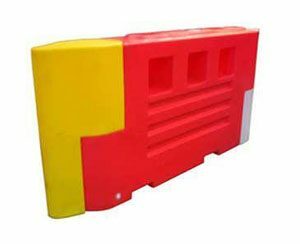 Although the majority are manufactured in red and white, other colours can be produced if required. Pedestrian barriers have weighted feet for added stability and come in 1 metre and 2 metre lengths. With a reflective strip on one side, they are compatible with Chapter 8 requirements. Also available with extra reflective strips, anti-trip foot system, and CLIP attachments. Our water-filled barrier systems come in large or small sizes, and light or heavy duty, making them suitable for virtually all requirements. For added security, they can be used with fencing. 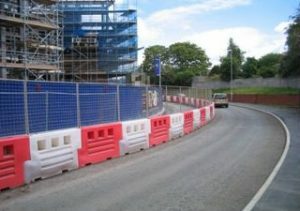 These fully interlocking barriers are made of UV stabilised prime polyethylene. This low level heavy duty system is best suited for road and site delineation.